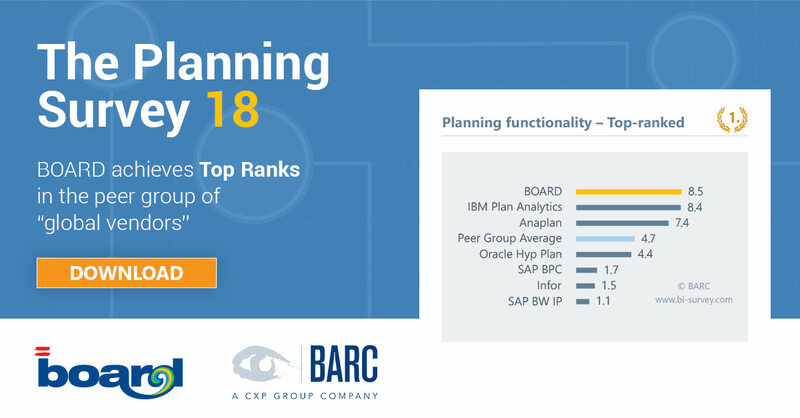 BOARD, the Swiss-made decision-making software, that combines BI, Performance Management and Predictive Analytics in a single platform, takes top marks in BARC’s The Planning Survey 18, the world’s largest survey of planning software users. With eight first places and 27 leading positions in important categories of the survey, BOARD International has consolidated its position as the leading supplier of integrated performance management and business intelligence software within BARC’s The Planning Survey 18. This annual research is based on customer feedbacks and it points out the strengths and challenges of many vendors in the CPM space across the world. Evaluating several features of the product, customers using BOARD have praised its planning and analysis functionalities, the price/ performance ratio and support in the peer group ‘global vendors’. 89% of users state that they are “satisfied” or “very satisfied” with BOARD. Additionally, the platform has been regarded as very impressive because it is particularly flexible, easy to use, and provides a large number of benefits and value to businesses. As the level of maturity of corporate planning increases, software support requirements increase too. The Planning Survey 18 confirms that although Excel is still widely used, a large number of companies, particularly mature ones, are focusing on professional planning solutions. Even expertise has increased greatly so that planning has reached a considerably higher level of maturity. Therefore, organizations are increasingly dealing with topics such as simulations and scenario management, predictive analytics and integration of strategic, financial and operational planning to optimize, speed up and simplify their decision-making processes. Thus, software tool requirements increase too. “The integration of planning, business intelligence and advanced analytics into one comprehensive solution is an essential part of effective, efficient corporate control and management and should therefore be considered in the software selection process,” explained Dr. Christian Fuchs from the BARC Institute. “For us it has always been clear that planning, analysis and reporting go hand in hand. Organizations can, for example, identify, track and evaluate driver relationships only with a directly interlocked planning and analysis solution, so as to quickly and accurately optimize decision making processes “ said Giovanni Grossi, BOARD CEO and co-founder. BOARD as an innovative trailblazer.